Catzowey! Life is meowvalous when Me & Myself snuggle with our favorito Book "Love Saves The Day" authored by my meowster pal Homer's momma! Yep uh huh my cat eyes always reading and meeting and greeting cuz that's what makes life Catzowey ! And itza fur shure that here izza Homer's Momma, the author and cat momma Gwen Cooper cuddling Me & Myself in purrrrstaticat form, and my Staff holding our pawsagraphed copies of her 2 books at the San Francisco SCPA in my City by the Bay. When Me & Myself are chillaxing in this PAWzishun itza cuz I'ma comfy cat and sending dat lil bit of love and more love across the Planet tooza youza. Yep Uh Huh, cuz Me & Myself izza comfurtable sending out luv cuz it's fur shure that Love Saves The Day! Hoorayzatini! And sometimes you gotta go digging but youza finds dat Lil Bit of Love in the strangest places! Come one and bring em all to the mostest meowvalous Wrestling match on da Planet. Itza so so so giganticat that my Aussie pals flew over dat Pacific Oshun to San Franfuncisco for a front row seat. 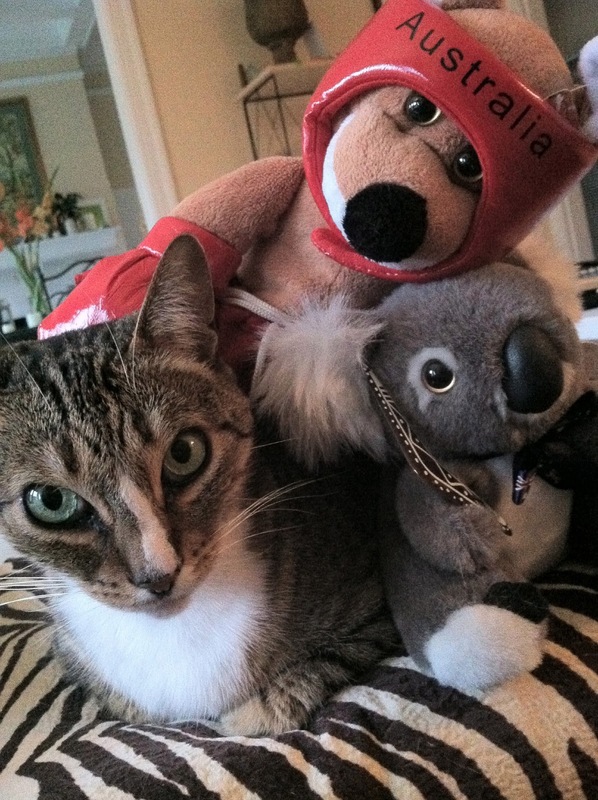 Kango is wearing da right purrtective helmet too & dat little bear gots thru the airport security with his booming returnable boomerang! In the blonde fur pants, we has Grazie and of course youza knows I'ma wearing my EyeTailYun deeziner Tiger stripes pants. We boyz checking out the middle of the Wrestling ring to be sure itza fair, squared and even too. Ding Ding - ROUND 1 and Me & Myself gotta da Grazie down and sure taking him by surprise! Ding Ding - ROUND 2 and Grazie does a flip uppa and over and izza ready to pin me & myself ... well datza what I'ma thinking. Catzowey! Itza ROUND 3 and Grazie pinning Me & Myself with dat double leg take-down move. I thinks he learned it on All-Star TeeVee Wabbit Wrestling! And whatza with his giganticat sized paws looking like heeza wearing boxing gloves or ready to play a tune on a giant Grand Steinway piano. Ding Ding - ROUND 4 and itza more purrfecto moment to sirPrize my wrestling partner with a hunky Hulk Hogan "hammer power punch". Ding Ding! The Finale ROUND 5 and dat catzowey ref says itza tie wrestling match so weeza gonna relax and chillax this week and gets rested and rev uppa for da finale wrestling series - coming sooner than you know. Now make it a nonCATastrophic week! What's A Better Cup Than a Cup of Catpuccino? Catzowey! I'm reporting live, yep uh huh itza fur shure I'ma live and not using my 9 lives at The AMERICA'S CUP races in San Franfuncisco. Itza got meowvalous security and all the San Franfuncisco Police are ecstaticat bout my attending. 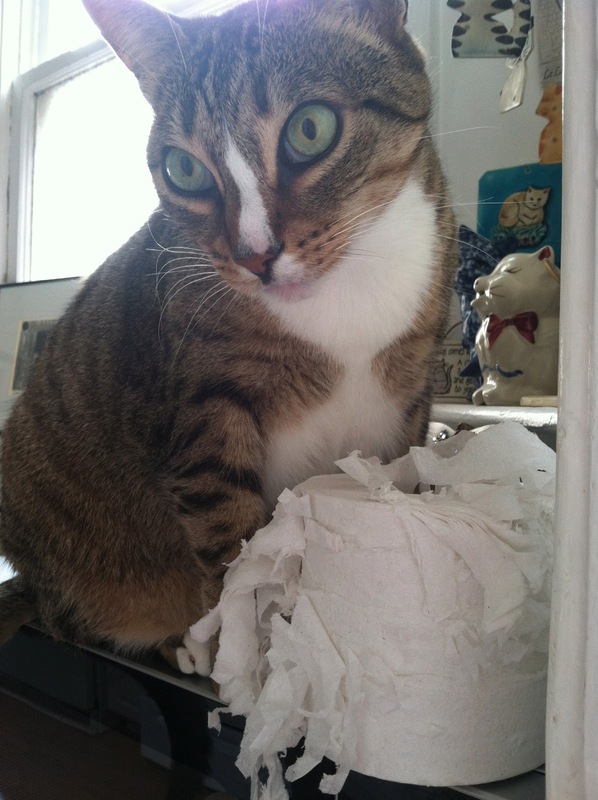 Itza all over the news that the sails of the CATamarans getting shredded in the wind, so I tried shredding cuz then I'm up to date on the Shred-Oh-Matic logisticat stuff! 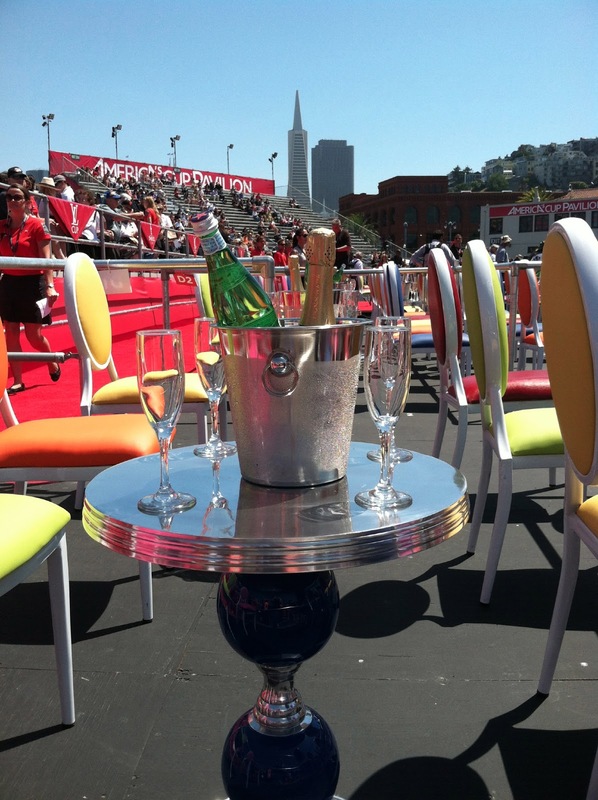 Fat Cats at The America's Cup drinking da bubbly with a view of my San Franfuncisco Kitty City skyline. 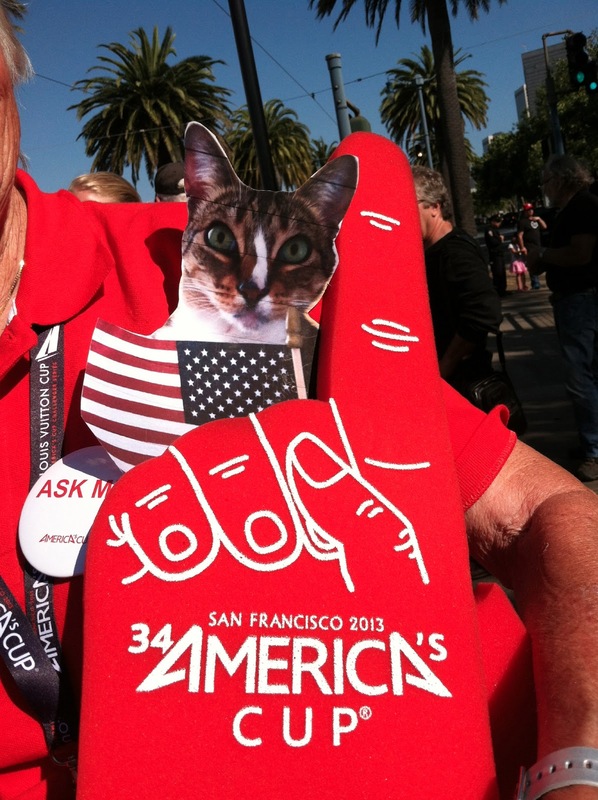 Pssst ... itza secret of course, and youza knows I'ma EyeTailYun kitty but my heart izza here with the USA at the America's Cup. Now if I can just get my cup o' Felidae favorito food filled uppa, I'll be a happy Man Cat no matter whooza wins dat CATamaran America's Cup race! There's 2 cups in this race: My food Cup and the America's Cup! Catzowey! Nothing finer than trying to CATCHIT and finally snagging it! La La La Labstah - thatza EyeTailYun for Loving da Lobster and I really did reel it in and CATCHIT! No catch & release for me. To be fit and ready to CATCHIT, Me & Myself always starts my day the GUIDO way with an Irish breakfast - not EyeTailYun pizza. Weeza CATCHITS it - yep we gottta our USA Flag and purrroud of it cuz America just had the 4th of July, ALL week long! WOWZA MEOWZA! Itza Me & Myself when I CATCHITS a great row of seats at a San Franfuncisco Giants game! Take me out to dat ballgame and I will purr fur shure.